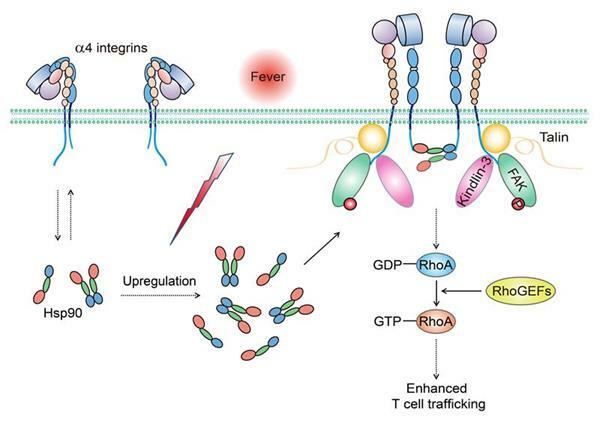 On Jan 15th, Professor Jianfeng Chen’s group from Shanghai Institute of Biochemistry and Cell Biology, Chinese Academy of Sciences, published a paper in Immunity titled “Fever Promotes T Lymphocyte Trafficking via a Thermal Sensory Pathway Involving Heat Shock Protein 90 and α4 Integrins”. This paper identified heat shock protein 90 (Hsp90)-α4 integrin axis as a thermal sensory pathway that promotes T lymphocyte trafficking and enhances immune surveillance during infection. Fever is a highly conserved response to infection or injury and benefits organism survival and the resolution of many infections. Emerging evidence suggests that fever-range thermal stress (38–40°C) plays an active role in directing migration of immune cells into secondary lymphoid organs or inflammatory sites. However, whether and how fever can regulate the function of integrins, the key cell adhesion molecules in mediating immune cell trafficking, has remained obscure. Under the guidance of Prof. Jianfeng Chen, Dr. Changdong Lin, Dr. Youhua Zhang and their colleagues have demonstrated that fever promotes T lymphocyte trafficking through Hsp90-induced α4 integrin activation and signalling in T cells. By using T cells from mice, the scientists found that fever increased Hsp90 expression in T cells and promoted α4 integrin mediated T cell adhesion and transmigration. Hsp90 was found to bind to the α4 tail and activate α4 integrins via inside-out signalling. The N and C termini of one Hsp90 molecule were found to simultaneously bind to two α4 tails, leading to dimerization and clustering of α4 integrins on the cell membrane and subsequent activation of the FAK-RhoA pathway to promote T cell migration. In addition, the scientists generated a knock-in mice line to disrupt Hsp90-α4 interaction in vivo and used several fever mouse models to study the biological function of the Hsp90-α4 integrin pathway. They found abolishment of Hsp90-α4 interaction significantly inhibited fever-induced T cell trafficking to draining lymph nodes and impaired the clearance of Salmonella typhimurium infection. In addition to T cells, this mechanism can apply to different immune cells expressing α4 integrins like monocytes and B cells, suggesting its general role in both innate and adaptive immune responses. This work was supported by grants from the National Natural Science Foundation of China (31525016, 31830112, 31601129, 31701219, 31190061), National Basic Research Program of China (2014CB541905), Personalized Medicines-Molecular Signature-based Drug Discovery and Development, the Strategic Priority Research Program of the Chinese Academy of Sciences (XDA12010101), China Postdoctoral Science Foundation (2016M601670), the CAS/SAFEA International Partnership Program for Creative Research Teams.